Cash, debit cards and prepaid cards all increased their share of payment instruments that households use in a typical month, according to results from the Federal Reserve Bank of Boston’s 2015 Survey of Consumer Payment Choice released today. 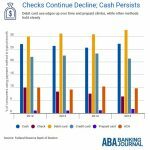 Cash ended a three-year decline and rose to 27.1 percent of all payments, while debit card use rebounded to 32.5 percent. Prepaid cards rose to a 1.6 percent share, up 60 percent from three years before. Paper checks continued a long-term decline, falling from a 10 percent share in 2012 to 6.5 percent in 2015. The share of credit card payments and online bill payments dipped as well. The survey showed that the average consumer made 68.9 payments per month, holding to a consistent trend over the past seven years. For the average consumer, 34.3 percent of payments were for retail goods bought in person, 24.7 percent were for in-person services, 6.8 percent were for online goods and services, 4.3 percent were person-to-person payments and 29.9 percent were for bills. Average cash holdings per person dipped 2.4 percent to $202, and a majority of consumers (52.7 percent) said they most often got cash from an ATM. The percentage getting cash from tellers declined 1.3 points to 19.9 percent, while the share getting cash at a retail outlet rose by nearly one point to 14.2 percent.